Anxious Star Wars fans (and online press) finally got what they wanted - a brand-spanking new trailer for Rogue One during the Olympics on Thursday night. A ton of new footage, more of Diego Luna's Captain Andor, more of Forest Whitaker's beautiful British accent, and a cameo from a dark-helmeted heavy-breather. Jyn Erso (Felicity Jones) and her band of unlikely heroes (a suicide squad, if you will) band together on a mission to steal the plans to the Death Star, the Empire’s ultimate weapon of destruction. 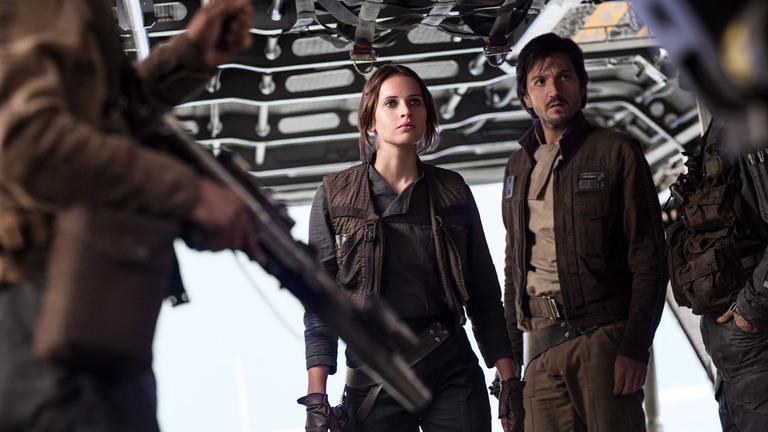 Andor has been the Rebellion's long-time recruiter and along with Chirrut Îmwe (Donnie Yen), Bodhi Rook (Riz Ahmed) among others, must risk everything to complete the mission. This entry in the stand-alone Star Wars movies is undoubtedly a "war film" as the trailer shows. It's not surprising if the rumors of reshoots to lighten the tone, make war more digestible to general audiences, and basically be more Disney-fied were true. This movie appears to be the darkest yet. And probably appropriate for an intergalactic space war with a genocidal Darth Vader at the helm of the Empire.